In another exciting turn of events in the 2007 Summer Music Games, the Bluecoats (83.700) won last night's competition in Centerville, Ohio against the Blue Devils (83.500) and the Cavaliers (82.700). 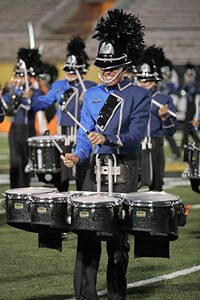 This is the first competition the Bluecoats have won this year after placing a close second at many others. last Saturday in Kalamazoo, Mich.
"Last night was a great performance, and the members are definitely excited about the rest of the season, but they're also very realistic and know that we still have a lot of work to do in the show," said David Glassgow, executive director of the Bluecoats. "We're approaching this season as we've approached every other season. We set out to do things a little better every year, and then we go out and do it." This victory is a large step in the Bluecoats' history as the corps has not been ahead of the Cavaliers since the late 1980s and never beaten the Blue Devils in a Drum Corps International competition. But as drum corps fans have already come to see this summer, the competitive tables can turn easily as the top seven corps have been switching placements almost every night. Also performing at Centerville High School Stadium last night were the Glassmen (74.100), Troopers (69.100), Cascades (68.600), Memphis Sound (68.700) and Revolution (60.850). The Bluecoats will go head-to-head with the Cavaliers again on July 6 in Michigan City, Ind., and will compete against both championship corps on July 7 in Canton, Ohio, where the Bluecoats may have some new tricks for audiences. "We do have some surprises up our sleeve," said Glassgow. "We're still not done with the show and we still have a lot of room to grow to really enhance our performances."